Let me start by stating that this Panasonic LCD monitor has a fully functional tuner built in. The LCD TV is scaled down a bit and looks like your typical black computer LCD monitor. But it's 20" and does a fairly nice job with an incoming NTSC signal. It's not as sharp or clear as the Sharp LCD TV unit of the same size but it has very strong black levels and contrast. One must adjustment with this unit is to tune the Sharpness setting all the way down to -30 to get rid of the Panasonic's poor image enhancement and display a clearer more realistic image. The Picture controls contrast and is the only other adjustment that means much on this simple unit. Depending upon room conditions you will likely tweak this setting all the way to maximum to receive a bright enough signal in a room with lighting. 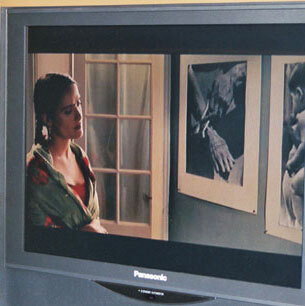 Viewing angle on this Panasonic LCD is about 45 degrees before degradation of picture quality. There are three preset LCD Television picture settings which are standard, vivid, and cinema. Vivid may be used for brightly rooms with ambient light conditions, Cinema - in my opinion would only be used with the lights completely off with this unit. Standard - gets rid of some of the false edges caused by the enhancement of the vivid setting. Generally, the picture settings do not provide much mobility. There is a level of motion artifacts and false contouring in the dark scenes - a drawback but not a huge concern. Colors and vivid and realistic as with most small LCD TVs. Remote and menu functionality are as simple as the manual that comes with the unit. More like a pamphlet really. There are just ample inputs with component, 2 X s-video, 2 X composite video, and an antenna receptor composite video. There is a strange omitting of a computer VGA style 15 pin input in this very monitor-ish TV. The speakers of 8 watts each are very robust for such a small monitor and will fill a normal sized room with plenty of volume. What price can you purchase it for? At $700 to $800 this unit is a good buy for the 20" size range. That is the assumption I will make for the value rating.